This locomotive was the third of the production English Electric Type 4's to enter service on British Railways (D200-D209 being prototypes). D212 was built by the English Electric Company at their Vulcan Foundry Works, Newton-Le-Willows, Lancashire and entered service on BR allocated to Willesden in May 1959. From the 1st June, she moved to Crewe North, firstly on loan and then permanently before moving to Carlisle Upperby in September 1959. Her next depot was Camden and she was allocated there from December 1960 until December 1965, when she moved to Bescot depot, remaining there until April 1966 when a transfer to western lines was made. August 1967 saw her transferred to Longsight depot, where she remained until June 1968, when she was allocated to D09 Manchester Division. She remained at D09 until June 1972 after which she moved to D10 Preston Division. May 1973 saw her move to Carlisle Kingmoor where she stayed until August of that year before moving back South to Longsight. December 1978 saw her back at Carlisle Kingmoor where she remained until being withdrawn from active service in February 1985. Out of the 25 Class 40's that were named, only three were named at an official naming ceremony, these being D210 Empress of Britain, D211 Mauretania and D212 Aureol. The remaining 22 loco's all had their nameplates fitted at BR workshops, either Crewe or Derby Works. The naming of D212 Aureol was carried out by Mr.M.Glaister, Director of the Elder Dempster shipping line at Liverpool Riverside Station on the 20th September 1960. February 1974 saw her renumbered to 40012 at Longsight depot but unfortunately by then the nameplates had been removed, so she never actually carried the ' Aureol' nameplates with the new 'Tops' number system. The locos last classified overhaul was at Crewe Works in June 1980 and by this time the name 'Aureol' had once again reappeared on the loco's body sides; only this time around it was hand painted on using stencils in red and white paint. The loco was finally withdrawn from traffic at Crewe TMD on the 8th February 1985, due to derailment damage, and dragged to Crewe Gresty Lane sidings for scrap. However, due to the Crew Station remodeling scheme, she was reinstated to traffic on 20th May 1985 at Crewe TMD and given the departmental running number of 97407 and restricted to a maximum speed of 35 mph for use on engineering trains only. Withdrawal for the second time around finally took place at Crewe TMD on the 4th April 1986 at 14:00 hours, the reason being cracked bogie frames. She was later moved to Crewe Basford Hall Yard for scrap. On the 1st September 1986, 97407 along with sister loco 97408 (ex-40118) moved from Crewe to Carlisle for the sole purpose of providing spares to keep the flagship of the class D200 running to for fill her railtour commitments. 97407 remained at Carlisle until 7th September 1988 when she travelled via Workington, Crewe and Nuneaton to Vic Berry's Yard at Leicester for Asbestos removal to be carried out, before moving on to her new home at the Midland Railway Centre. The loco arrived at the Midland Railway Centre on the 3rd March 1989, with the first working party taking place on Sunday 5th March. One of the first job's was to replace all the missing windows, to protect the loco from the elements of the weather and to make her secure. This done we decided to smarten up the appearance of the loco in view that she had been requested to appear at the last ever Coalville open day which was held on Sunday 11th June 1989. After the loco returned from this event we set about the enormous task of restoring her back to full running order. Off came the old paint work, numbers arrows etc. leaving a smooth area of shining new metal beneath. Then all the rotten body panels were replaced with new steel and undercoated in red oxide paint. However, while working on the power unit, we discovered a massive 73 inch fracture right across the free end of the engine block. The cause was down to not draining the coolant out of the power unit once the loco was finally withdrawn. Once we had all got over the shock, we made several enquires with regards to repairing the fractured block and eventually made contact with a firm in Sheffield who specialized in stitch welding repairs on cast iron. While this repair work was taking place, we completely repainted the whole engine room compartment, which transformed the whole appearance of the locos interior. Work was also well advanced on restoring both cabs with all the missing parts now back in place and undercoating now in progress. The full restoration of the loco took just over four years to complete but well worth every hour that was spent on her. On Wednesday afternoon 22nd April, the loco departed from the Midland Railway Centre and headed back home to Longsight depot, arriving there at around 19:00 hours that same evening. As the convoy approached the depot the staff could not believe their eyes, only a few weeks ago the loco was still in undercoat when they visited the MRC to help refit the locos air tanks. On the Saturday morning 25th, Longsight staff fitted the two nameplates back onto the loco which had been kindly donated to the group by Dave Belshaw along with the four works plates. During mid-afternoon on the Saturday the loco was re-dedicated with the name 'Aureol' in a short naming ceremony carried out by Mr. Pete Waterman. Diesel wise, the loco stole the show, an immaculate named Class 40 back at Longsight depot in 1992 was more than most people had ever imagined . After the glory of Longsight open day, it was back to work again and during the summer of 1992, the power unit was gradually rebuilt. A date was eventually set for firing the loco up for the first time in preservation, which was to be during the MRC's autumn diesel gala. On the Sunday afternoon around 15:00 hours, with a massive crowd of supports who had turned out to witness the event, we made what was to be the first attempt at firing the loco up. However due to low battery power this first attempt was unsuccessful so we decided to charge the batteries for another hour and have another attempt. Meanwhile we went to the nearest garage and purchased four cans of 'Easy Start' one for each turbocharger. An hour later with the light starting to fade, we decided to try again, this time the power unit started to turn over a lot faster and you could hear the popping and banging has each cylinder started to fire. Then to the cheers and shouting from the crowds Aureol burst into life for the first time in preservation. On 17th July 1993, Aureol made its first public run in preservation. As the loco approached Butterley Station with air horns blasting away, she smashed through a special banner welcoming her back into traffic. She then departed on her inaugural run, the 11:00 service from Butterley to Riddings. Over that weekend, the loco made several return trips, all without any problems what so ever. Once the loco was fully restored and in full working order the demand for her at BR open days and other preserved lines was hard to believe and at one stage it seemed that 212 was taking over where D200 had left off. During 1992, the loco visited Longsight, Doncaster Works, Bescot and Leicester. 1993 was no different with Aureol visiting Worcester and Worksop open days, but 1994 was to become the best year so far, when she visited Exeter rail event, Worcester open day for the second time and Doncaster Works again for the second time along with Crewe Basford Hall Yard. The last open day the loco visited was Crewe Basford Hall Yard in 1995 since then the loco has been restricted to the MRC lines only. The first preserved railway Aureol visited was the Severn Valley Railway in May 1994 for their diesel gala event which was spread over three days. The group had already been invited to both the Exeter rail event and the Worcester open day, which fitted in nicely with the Severn Valley gala. The following year saw us visit the Mid-Hants Railway for a two day diesel gala over 4th & 5th March. Over the two days the loco behaved faultlessly and gave a sound performance over the step banks which are nicknamed 'the Alps'. Today Aureol can be found hauling a wide variety of services at the Midland Railway - Butterley; these include passenger services, demonstration freights and appearances at various diesel galas. The loco is also a firm favorite for Driver Experience courses which are held at the centre normally twice a year. In August 2001, a decision was made to take the loco out of traffic for what was thought to be just normal routine maintenance and body work repairs. However as we were to find out later, there was far more work involved than we had first anticipated which took us nearly four years to complete. By May 2005 the loco was in all over light green undercoat with a light grey roof and was ready for top coating in 1960's style dark Brunswick Green, light grey roof and a small yellow warning panel in time to take part in our own weekend during mid-June. Unfortunately, due to circumstances beyond our control, no inside shed space was available, which basically meant the loco would now have to make an appearance at our own event in undercoat. A decision which was not taken lightly at the time and will not be repeated in the future. It was almost a year later before Aureol managed to get inside the shed for her much needed repaint and emerged some two weeks later in 1960's Brunswick Green with small yellow warning panel and light grey roof. Numbered D212 and carrying the name Aureol the loco looked immaculate and was a credit to all those who spent so many hours working on the loco to make it happen. Since then the loco has become very popular amongst enthusiasts and the general public and as work a variety of train on the Midland Railway - Butterley and even took part in several photo charters organized by the EMRPS. Ever since we purchased the loco off British Railways back in 1988, we have suffered battery problems which as caused us some major problems and headache over the years and on more than one occasion let us down really badly. To try and rectify the problem we have fitted several second hand sets of batteries to the locomotive, from scrap class 47's and 56's. To start with the batteries were fine but soon started to deteriorate after only a couple of years usage, which would then put us back to square one once again. We finally overcome this problem in June 2007, when we fitted a brand new set of batteries to the loco, made possible thanks to our member’s kind generosity and financial support. The locomotive now starts first time without any problems and is at long last 100% reliable. On May 25th, 1959, a brand new shining D212 rolled out of Vulcan Foundry Works, Newton-Le-Willows and headed towards Doncaster Works for acceptance trials. Five days later the loco was accepted into traffic by BR and allocated to Willesden Shed (1A). Fifty years later, D212 back in its original green livery, is still going strong and can be seen operating trains over the MR-Butterley line on special occasions. Ever since the early 1980’s, the loco has been inundated with fractured bogie problems and despite the locomotive having several bogie swaps during the later years on BR the problem never went away and in fact became the main reason for its withdrawal from service in 1985. Aureol was one of the class 40’s reinstated to traffic has a departmental class 97 (97407) for a short period of time working mainly around the Crewe area but again in the end the loco was withdrawn for fractured bogies. When the group purchased Aureol off BR in 1988 it was well aware of the fractured bogie problems and did in fact purchase two spare bogies from Crewe Locomotive Works as some sort of insurance against later times in preservation. Aureol was finally withdrawn from operating service as a departmental locomotive numbered 97407 on 4th April 1986, due to fractured bogies and dumped in the siding at Crewe Basford Hall Yard. She was eventually moved to Carlisle Kingmoor depot as a Christmas tree of spares for D200. The locomotive was Purchased by the Class 40 Appeal in May 1988 and arrived at the Midland Railway Centre on 3rd March 1989. Within a few days of the loco arriving on site restoration work commenced and one of the first jobs undertaken was to measure and record the various fractures in both bogies for future reference. From that day till now, there has been no additional movement from any of the fractures and measurements taken recently still measured the same length now as they did when originally taken back in 1989. In the early days, the loco was inspected quite frequently and on no occasion was there ever any mention of bogie fractures or stopping the locos movements because of this. In fact the loco was that popular at one time she seemed to be requested for all the major open days and was just starting to become a sort after machine at preserved railways when disaster hit. The loco past its movement examination to attend the Mid-Hants diesel gala in March 1995 but failed on the return examination because of the fractured bogies. Eventually a one journey only movement was allowed to the Midland Railway - Butterley via Crewe Basford Hall Yard open day in August 1995 and the loco has not been anywhere since. To date through our own membership, we have already made a start on trying to raise sufficient money to repair the bogies on Aureol. On top of this, we authorized AEA Technology Rail to carry out a Class 40 bogie repair feasibility study and a welding specification procedure which has cost us in access of £2,000 so far. The estimated cost of lifting the loco and repairing both bogies to mainline standards, so the loco can once again move around the country to various diesel galas is somewhere in the region of around £10,000. Through the kind generosity of members and keen rail enthusiasts with a soft spot for class 40’s, we have managed to raise just over £11,500 towards repairing the bogies. On June 17th 2013 Aureol left the MR - Butterley for the first time in eighteen years and moved to Barrow Hill Roundhouse for bogie repair work to be carried out. Nine days later, and the locos in the Deltic Preservation Society’s shed at Barrow Hill lifted off its bogies in readiness for the welding work to begin. Now some five months later, the welding work is complete and for the first time in almost thirty years Aureol has fracture free bogies. Work will now concentrate on removing the air tanks for re-certification (ten year) then its bodywork attention and a full re-paint. Since the loco arrived at Barrow hill in June 2013, we have spent nearly £40,000 on her. The list work carried out on 40012 at Barrow Hill over the past five years is endless to say the least, jobs such has radiator repairs, both of these were removed out of the loco and sent away to a firm in Stoke-on-Trent for a full overhaul. Other work involved major body work repairs which involved replacing all the old rotten body panels with new ones. After all this work was completed the loco received a full repaint into BR Blue livery with full yellow ends, numbered 40012 and carrying the name plate Aureol. New window rubbers replaced the old ones which had all perished over the years, a replacement set of batteries were fitted, new engine oil and fitters, new fuel fitter and both cabs completely re-painted. This are just a few of the jobs that have been done on the loco and there is still more work needed to bring the loco up to scratch. The next major job is to overhaul or replace the four turbo charges which really need doing at a cost of around £2,000 each. The list of work needed on the loco is never ending, theirs always something that needs doing. On Monday 9th April 2018, Deltic number D9009 towed 40012 Aureol and D213 Andania from Barrow Hill to York to collect D200 and then forward to the East Lancs Railway for the class 40's 60th Anniversary event. Six 40's in one place at the same time had not been seen since 1985, prior to the class being withdrawn off BR. 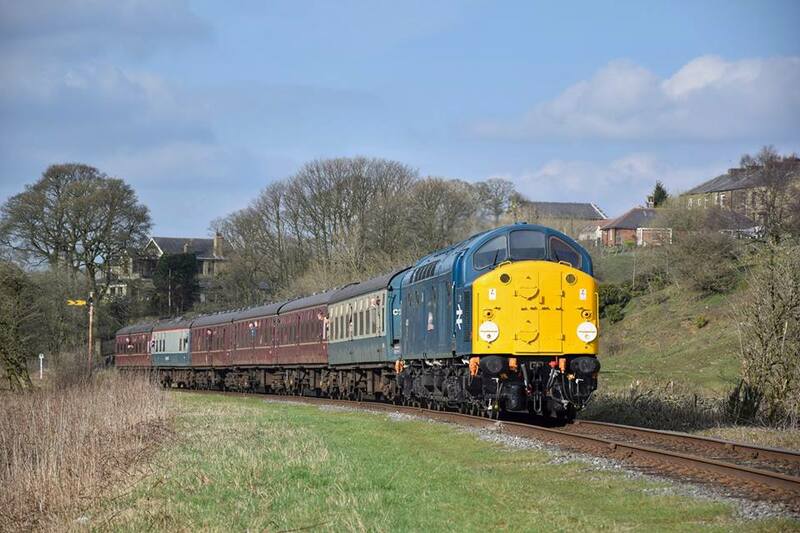 The ELR Class 40 event featuring D200 (static exhibit only) 40012, D213, 40106, 40135 and 40145 was highly successful with loads of people turning up for the three day event from April 13th to 15th. After the event D200 and D213 returned back to their respective homes at the National Railway Museum and Barrow Hill but 40012 is stopping on at the railway for an extended visit. Anyone who missed 40012 at the ELR Class 40 event can still travel over the line on the loco in the fourth coming months. Simply log onto the ELR web site for further information.